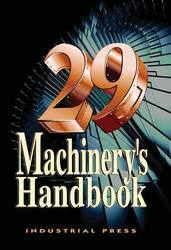 The Machinery's Handbook is now available in a new and revised 30th Edition. To see this new ebook title and related products, click here. Machinery's Handbook has been the most popular reference work in metalworking, design, engineering and manufacturing facilities, and in technical schools and colleges throughout the world for nearly 100 years. It is universally acknowledged as an extraordinarily authoritative, comprehensive, and practical tool, providing its users with the most fundamental and essential aspects of sophisticated manufacturing practice. The 29th edition of the "Bible of the Metalworking Industries" contains major revisions of existing content, as well as new material on a variety of topics. It is the essential reference for Mechanical, Manufacturing, and Industrial Engineers, Designers, Draftsmen, Toolmakers, Machinists, Engineering and Technology Students, and the serious Home Hobbyist. New to this edition … micromachining, expanded material on calculation of hole coordinates, an introduction to metrology, further contributions to the sheet metal and presses section, shaft alignment, taps and tapping, helical coil screw thread inserts, solid geometry, distinguishing between bolts and screws, statistics, calculating thread dimensions, keys and keyways, miniature screws, metric screw threads, and fluid mechanics. Numerous major sections have been extensively reworked and renovated throughout, including Mathematics, Mechanics and Strength of Materials, Properties of Materials, Dimensioning, Gaging and Measuring, Machining Operations, Manufacturing Process, Fasteners, Threads and Threading, and Machine Elements. The metric content has been greatly expanded. Throughout the book, wherever practical, metric units are shown adjacent to the U.S. customary units in the text. Many formulas are now presented with equivalent metric expressions, and additional metric examples have been added. The entire text of this edition, including all the tables and equations, has been reset, and a great many of the figures have been redrawn. The page count has increased by nearly 100 pages, to 2,800 pages.